The Yik Yak Yakarma Kart visited UNC-Chapel Hill’s campus today, Monday, March 2, where Yik Yak representatives handed out free merchandise to users of the app. Depending on your Yakarma score, users traded in points for Yak-branded swag including flat billed hats, socks, flags, keychains and stickers, among other cool gear. This marks just another stop for the app during its Spring #RideTheYak Campus Tour across the Midwest and East Coast. With the goal of visiting 59 schools in 34 states, two busses are traveling across the United States to rep the popular social media app. 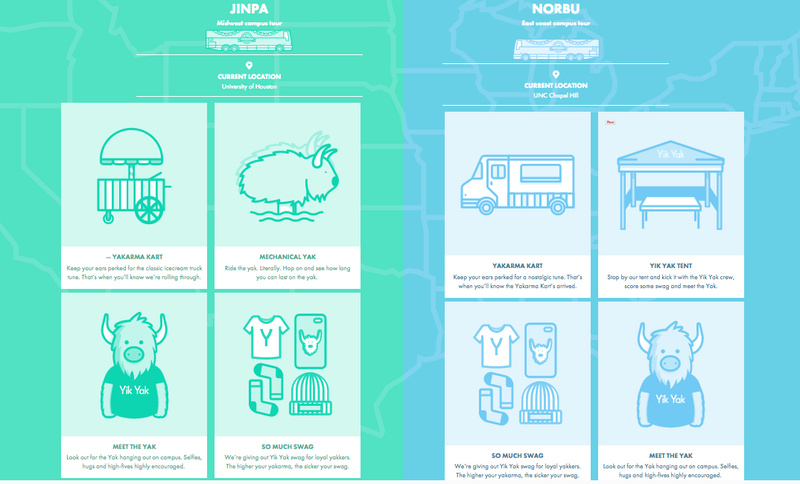 The “Jinpa” bus is currently driving all over the the midwest, bringing college campuses fun events, free stuff, and the opportunity to #RideTheYak — a mechanical bull that travels with the team to each campus. The “Norbu” bus is taking on the East Coast, stopping to visit the including the University of Houston, the University of Central Florida, Georgia Tech, the University of South Carolina, and the University of North Carolina at Chapel Hill’s campus. While the East Coast tour doesn’t promise a ride on the mechanical yak, our bet is you could get the Yak mascot to give you a piggy back ride if you asked nicely. 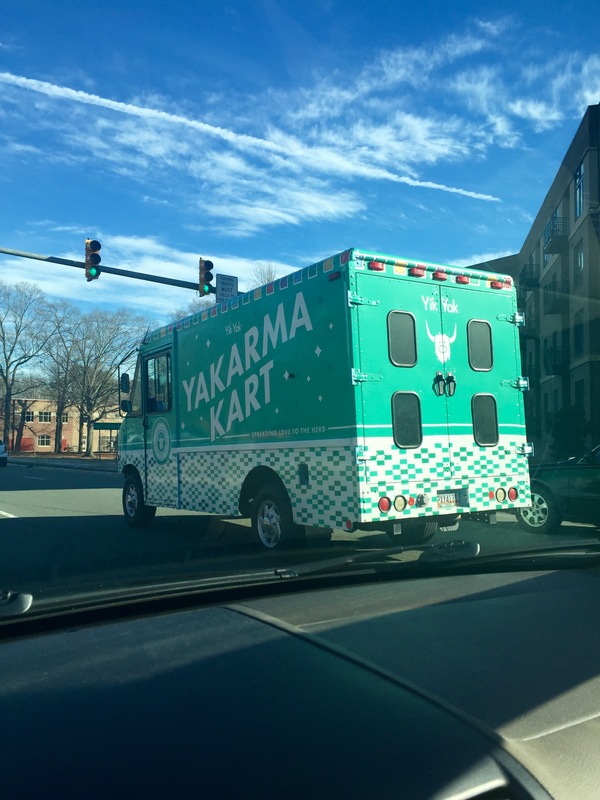 We spotted the Yakarma Kart driving from UNC’s campus at about 4 pm today. No word on whether or not the Kart will be back tomorrow. We’ll keep you posted with more information, so check back soon to find out if you can take a #selfie with the Yak tomorrow! We took a look at the Yik Yak #RideTheYak video from their first campus tour last fall and it looks like the Yakarma Kart may be headed to more places other than The Pit. If you’re hoping to swipe some swag tonight, you may be able to find them at popular bars or places on campus. We’d place a bet that the Yakarma Reps might visit He’s Not Here, the Old Well, the Bell Tower, the Dean Dome, South Campus dorms, Rams Head Dining Hall or Lenoir to capture footage for their Spring 2015 video. In case you’re wondering, here’s a look at the 2014 #RideTheYak video from Fall 2014. 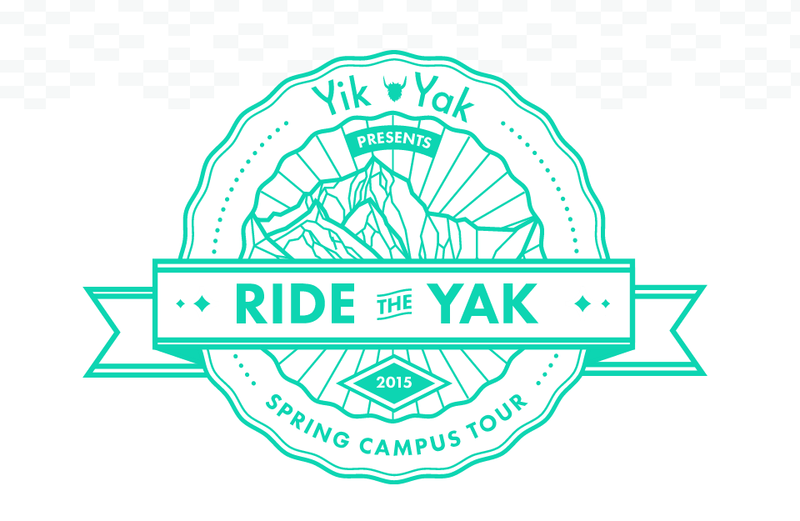 For more information on the #RideTheYak tour, or to see the current location of either bus, check out Yik Yak’s blog. Did you hug the Yik Yak mascot today? Let us know how Yik Yak’s reps and swag were in the comments below! Google Plus Stream Posts Showing Up In Google News | How Many Instagram and Social Media Pictures Are of Food?